MIL Collections took Mr Brocklehurst to court after having bought an alleged parking debt from Llawnroc Parking Services. The case was heard at Truro, where MIL are based. MIL sent two representatives and Mr Brocklehurst defended himself. The Judge threw out the case before Mr Brocklehurst had presented any points on the grounds of the pictures signage MIL submitted was obviously not from where the alleged offence took place. The Judge was obviously well aware of the nature of the Llawnroc operation. The Prankster has received a number of emails from people who complained to the Solicitors Regulatory Authority about Michael Schwartz. Mr Schwartz shall act as a solicitor only in employment, the arrangements for which have been approved by the SRA. Mr Schwartz is not to be a recognised sole practitioner, manager or owner of an authorised body. Mr Schwartz shall not hold, receive or have access to client money, or act as a signatory to any client or office account, or have the power to authorise payments in or out of any client or office account or any transfers from any client or office account. Mr Schwartz shall immediately inform any actual or prospective employer of these conditions and the reasons for them. This is presumably why he is now signing particulars of claim as a Civil Enforcement Limited employee. It's obviously quite amusing the SRA think CEL is a fit and proper employer, considering the way they conduct litigation. Mr Schwartz is still under investigation for other matters which are being considered by the Solicitors Disciplinary Tribunal. Any decision will eventually be published on the Solicitors Disciplinary Tribunal website here. Despite this, Mr Schwartz is still ignoring practice directions. His company is sending out wholly deficient letters before claim which give the defendant no idea what the claim is about. The Prankster has receive a large number of identical draft particulars. The badly mailmerged documents only contain two pieces of individual information - the name of the defendant and the name of the car park. The covering letter also contains a supposed PCN number. The defendant therefore has no idea what the claim is about - what the date of the parking event was, what the vehicle was, why the charge arose, what the original charge was, what the alleged contract was, or in short, anything useful at all. Mr Schwartz's company CEL then ignore any attempt by the defendant to find out what the charge is about, and go on to file a claim. This time, the actual particulars filed arrive within 14 days, and are slightly more revealing. They are again identical to all other claims, but this time the badly mailmerged new particulars do reveal the date, vehicle and carefully selected words from the supposed signage. This is of course, yet another signature to add to the Michael Schwartz collection. Any defendant who has received wholly deficient letters before action and particulars of claim like this can refer the matter to the Solicitors Regulator Authority for consideration in the upcoming tribunal. Any other matters concerning Mr Schwartz can also be raised. If you think this is how solicitors and parking companies should conduct litigation then please ignore this blog. Otherwise, please ask the government to investigate by signing Barry Beavis's petition. MIL didn't turn up. Again. Quelle Surprise. Mrs C was accompanied by her lay representative, John Wilkie (16-2) from the BMPA and a witness. MIL's bundle did arrive and they asked for the matter to be considered without their attendance, which was not objected to, because it was fatal to their case. 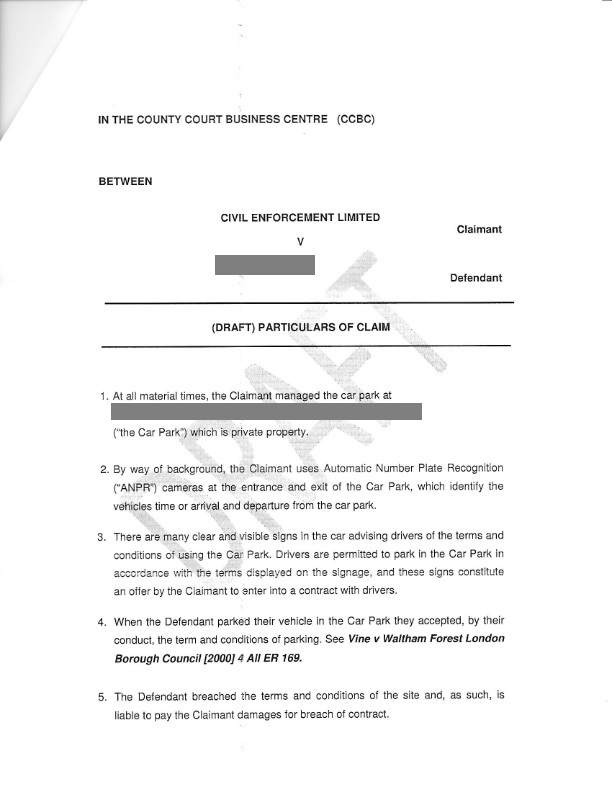 This was a Keeper Liability case, where MIL were pursuing the keeper for a ticket issued by CPMS/CPMS Ltd. However, the keeper was not the driver, and MIL's own evidence clearly showed that the driver had been named in August 2014, long before MIL got involved. As there was no keeper liability, there was no case to answer. The claim was dismissed with Witness and Client loss of earnings for the day. Mr Wilkie also asked for a Civil Restraining order. On this point the judge wasn't satisfied on Unreasonableness so declined to answer. Mr Wilkie (now 17-2) has no losses representing motorists against MIL, but does have losses against ParkingEye and UKPC. The British Parking Association have has a rethink and have agreed to fully re-hear all stayed POPLA cases. Both parties will also be allowed to submit further representations. The Prankster would like to thank everyone at IPSA for taking the stand they did, everyone who supplied evidence to IPSA..and of course the BPA for changing their mind once the true picture emerged. The Prankster understands that the BPA letter confirming their decision will be made available on the BPA website in due course. The company are a scaffolding and roofing contractor, who are a sub-contractor to the main contractor carrying out building work at the Royal Free Hospital. They had a number of vans coming and going which were recorded as contractors’ vehicles, but PE tried to claim that only a maximum of 4 of their vehicles could be put on the ‘white list’. What a very interesting day E&D Scaffolding (EDS) had in court with Parking Eye (PE). Deputy District Judge Woods (DDJW) was not impressed with PE's stance on this matter or PE’s representative, Mr Gibson one little bit. The nub of PE's claim was that EDS were not permitted to enter the Royal free Hospital (RFH) for free. PE were relying on the signs that a driver passes and or reads when entering the Royal Free Hospital as being the contract; ie when you drive into the Royal Free car park area the sign stipulates the terms and conditions of entering the Royal Free and this is the contract; PE claimed that E&D Scaffolding broke the contract. DDJW asked the PE representative on numerous occasions during the hearing that “had they put forward all their details of claim and had no further points to add to their claim?” The PE representative replied they had put forward all their points and they had no further points to add. The EDS defence was that they were contracted as a sub contractor to supply and fit/dismantle scaffolding for the NHS Royal Free Hospital maintenance main contractor so were allowed to enter the Royal Free Hospital to do contractual works. The Judge was very accepting that PE were very difficult to get hold of due to no e-mail contact address or telephone number and this made it very difficult to contact PE to try to advise PE of all EDS registration numbers so EDS could be exempt. The registrations had been given to the main contractor to forward on. DDJ Woods dismissed the Barry Beavis Judgement as irrelevant and said that it would play no part in the hearing due to its complete irrelevance to the current claim. In his judgement he found that Parking Eye had no grounds for any claim against EDS and that they were most vexatious and unreasonable in their pursuit of EDS for the fines. This was especially so because a Charge Notice that PE had issued EDS on the very same day as the Charge Notice that PE were claiming for at the hearing had been cancelled by PE in November 2014. DDJ Wood found that a contract had been made between EDS and the main contractor and intern with the Royal Free Hospital/landlord/owner of the land prior to entering the FRH to supply and erect/dismantle scaffolding for maintenance works at the Hospital; and this contract was in place before the alleged contract that PE were claiming was made when EDS entered the Hospital and passed the PE signs. Therefore the alleged ParkingEye contract was superseded. DDJ Woods was not happy with ParkingEye in any shape or form for bring the claim against E&D Scaffolding Contractors Limited. The judgement was a slam dunker against Parking Eye. The judge dismissed the claim as ‘utter nonsense’ and laid into Mr Gibson, the LPC rep, for wasting court time with what was clearly a vexatious claim. This is an important judgment because it shows that if you have a valid prior contract or authority to park, then the parking company cannot override this. This might occur in several situations. For instance if you are a resident and have authority from a managment agent to park at your residence; or if you made a contract with a company such as Bargain Parking to park at one of their sites. Meanwhile, if ParkingEye need a bigger database which can accommodate more than 4 entries, The Prankster will be more than happy to recommend some modern platforms which can cope with this type of stress. In return, all that would be required for this service, would be a watch. If you think it's wrong for ParkingEye to attempt to penalise legitimate contractors working at a hospital just because their system capacity is pathetic, then please consider signing Barry Beavis's petition to get the government to look at the private parking industry. 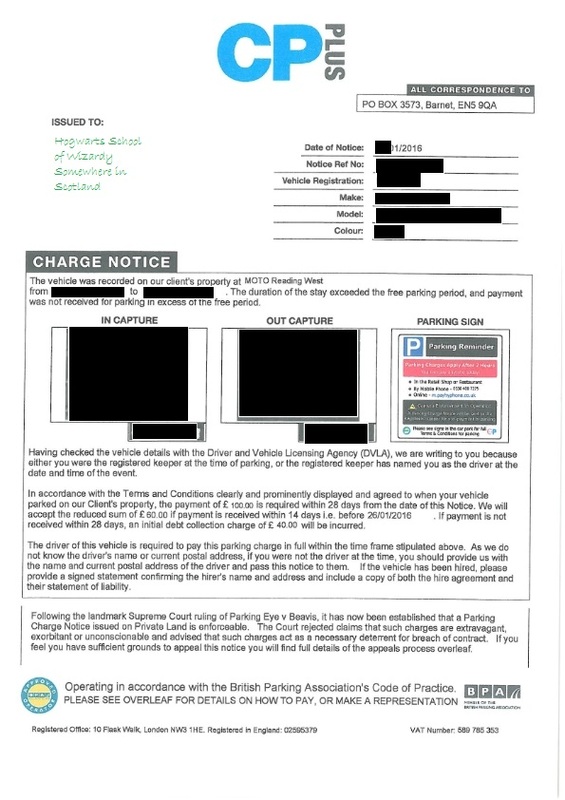 The Prankster gets regular mail from motorists who say they purchased a ticket from a ParkingEye car park...then a few days later get charged for not buying a ticket. The trouble is, by that time they have lost or discarded the ticket. No matter what they say to ParkingEye, their pleas fall on stony hearts; ParkingEye refuse to believe a ticket has been purchased. If the motorist does nothing then ParkingEye carry on to court, charging them all told £200 or more for allegedly failing to buy a ticket. But are ParkingEye's systems reliable? And if not, how many motorists are being charged hundreds of pounds due to ParkingEye's shoddy systems? Here is one example. The motorist parked in Swiss Cottage London, which offers £10 all day parking. The motorist purchased a ticket for £10 within 3 minutes of arriving, and entered their correct registration number. 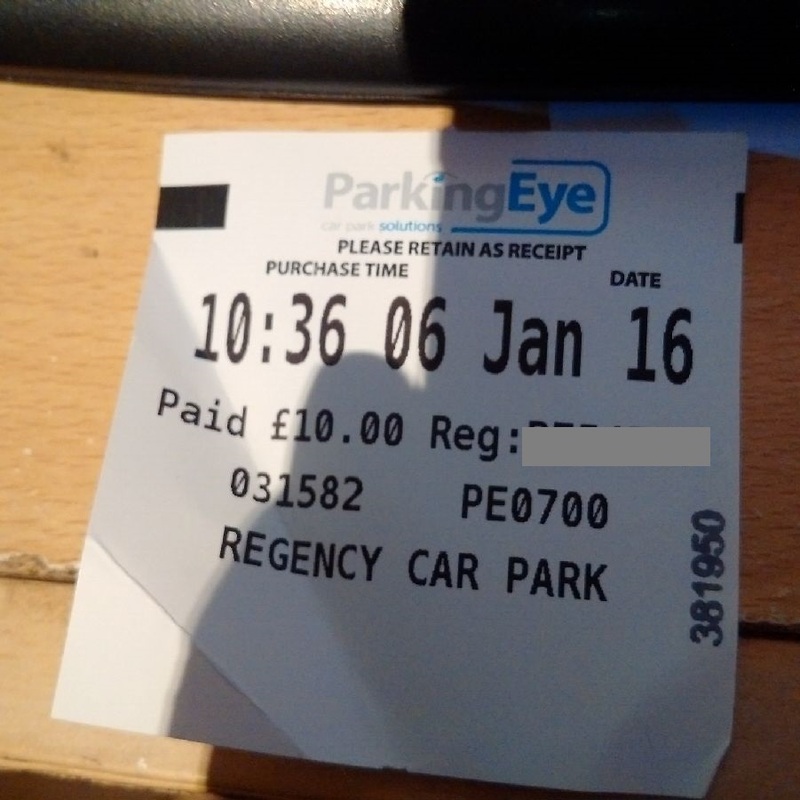 ParkingEye, for reasons only known to them, issued a parking charge. This motorist was lucky and kept a copy of their ticket. They were also lucky ParkingEye wrote to the correct address. ParkingEye have been known to write repeatedly to the wrong address, file a claim at court and get a CCJ. This motorist could well have found themselves unable to get a mortgage or run a business due to errors in ParkingEye's systems. The big question of course is, how broken are ParkingEye's systems and how often do errors like this occur? In this case the motorist stayed 2 hours in a car park free for 3 hours...and still got a ticket from ParkingEye. If you purchased a correct ticket and ParkingEye are taking you to court, feel free to file the above evidence to show how unreliable ParkingEye's systems are. If you think that parking companies should only issue charges when there is a reason, and should not issue bogus charges whenever they feel like it, sign Barry Beavis's petition asking the government to take action. Alternatively, if you are happy to get a CCJ when you have done nothing wrong, please ignore this. 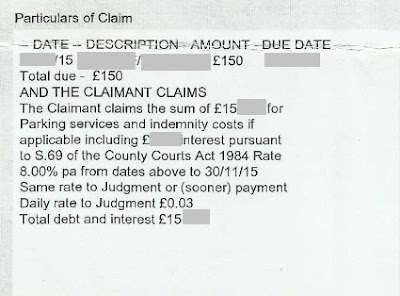 VCS v Ms M. 3QZ53955 25/01/2016 Claim discontinued. Costs awarded to motorist. The Prankster was contacted by a motorist shortly before their court hearing. The motorist had received a claim from Vehicle Control Systems out of the blue for 6 parking tickets which they knew nothing about. 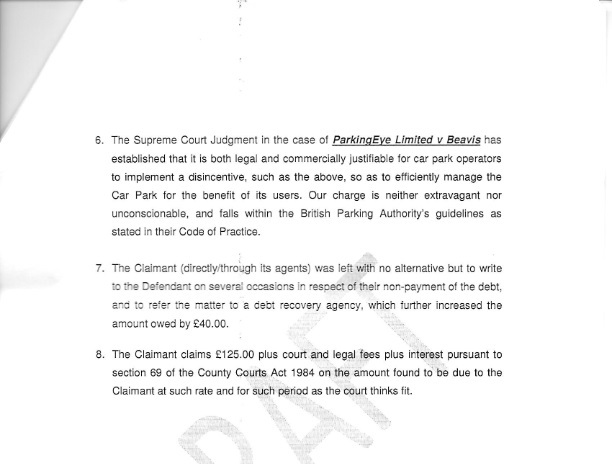 This is not an isolated incident - The Prankster has helped with another such case in the past from Excel Parking, (another company in the Simon Renshaw-Smith stable) and this seems to be a typical modus operandi - file a court claim without providing any prior information. The Prankster took a look at the claim, which was fatally flawed. Although VCS were making the claim, all the signage in the car park was in Excel's name. VCS have form for this kind of claim, and have previously filed claims for parking charges in car parks where they have no contract with motorists. The motorist had covered the salient points in their defence, but Prankster was able to advise on further evidence to file and points to raise in a witness statement, and contacted the British Motorist Protection Association to see if a lay representative was available for the hearing. It turned out John Wilkie, who had a 15-2 record against parking companies, was. John Wilkie suggested some more points for the witness statement. 24 hours later VCS contacted the motorist to inform them they were discontinuing the claim. The motorist had suffered substantial stress as a result of the claim, as well as monetary loss, so asked for the hearing to take place anyway as a costs hearing. VCS sent a lawyer to the costs hearing, and were unable to come to an agreement pre-hearing, so the hearing took place. The motorist was awarded their costs of attending the hearing, together with costs for their lay representative and a proportion of their printing costs. Mr Wilkie, who now has a 16-2 record against parking companies, also asked for the case to be referred to the Civil Judge as VCS have a history of filing claims for which they have no standing, then cancelling at the last minute. VCS have a new litigation manager called Jake Burgess. Jake does not appear to be any more successful than his predecessors at filing credible evidence. Previously The Prankster caught out Joel Douglas filing a parking charge notice for a parking event in 2012 which has a format which Excel only started to use in 2014. 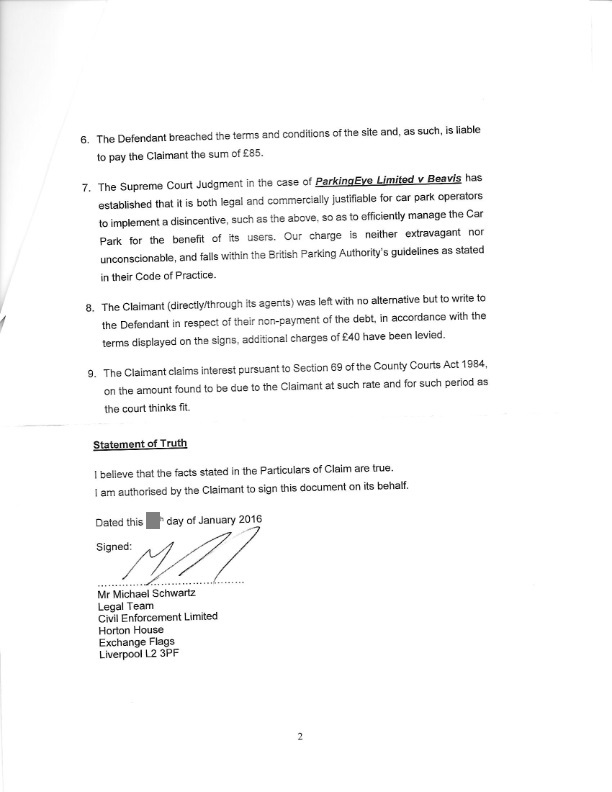 In this claim, Jake Burgess filed evidence claiming to support his claim, but which actually seemed to suggest the car was in two different car parks at the same time. It does seem from this that VCS's internal systems are not to be trusted and may well be issuing parking charges where none actually exist. 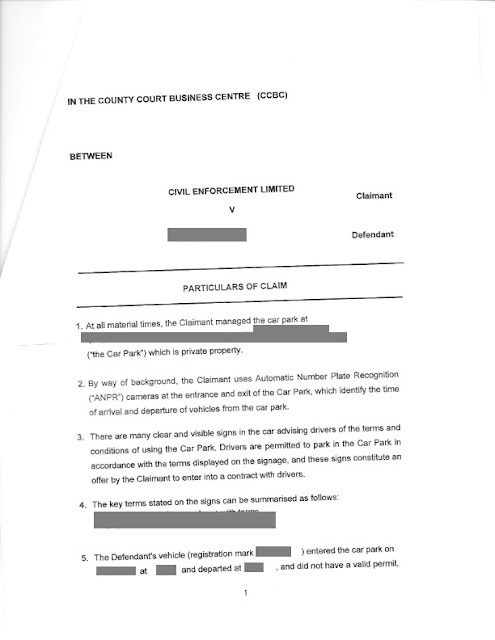 Jake Burgess also filed photographs of signage which he claimed were present at the time, but which were dated 2021 and in the middle of the night. It does seem that parking companies have a little trouble with their timestamps. 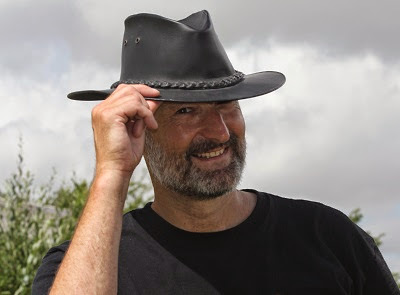 The Prankster suggests anyone with a court claim for Excel or VCS takes a close look at the evidence filed, and raises any points they disagree with on their witness statement. Do you think parking companies should file claims for incidents which did not happen, and provide false evidence in court? If not, sign Barry Beavis's petition to get government to look at private parking. Did ParkingEye deceive The Supreme Court with incomplete evidence? Here is a copy of the signage ParkingEye submitted to the Supreme Court regarding the Beavis case. Here is a copy of signage also on site, but which was not considered by the Supreme Court. The difference is small but important. Failure to comply with the following will result in a Parking Charge of £85. Failure to comply with this will result in a Parking Charge of £85. The word 'this' is ambiguous. Does it refer to the whole sign? The following conditions? The preceding conditions? The conditions in the same font size? Several judges have already considered this signage wording, and have concluded it is ambiguous. It is therefore a matter of incontrovertible fact that the sign is ambiguous. In such cases the Unfair Terms in Consumer Contract Regulations 1999, section 7, comes into play, and the term must be interpreted to the benefit of the consumer. This has resulted in judges cancelling ParkingEye's claim in all known cases where it has been brought to their attention. The judgments of ParkingEye v Collins-Daniel, ParkingEye v Lemon and Harris and Excel v Hetherington-Jakeman are examples of this, and can be found here. "Failure to comply with this” Singular ‘this’: “will result in a parking charge of: £85” Now, what’s ‘this’ mean? [...] “Parking limited to 4 hours (no return within 1 hour)” Is that a ‘this’? If I return within one hour is that one of these ‘thises’? 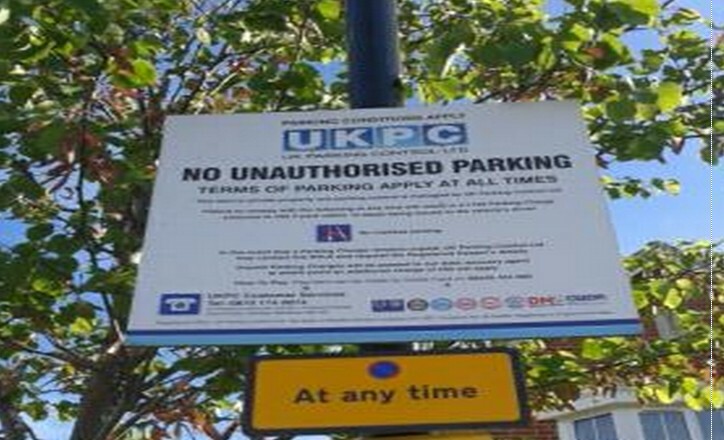 However, they have taken a point on the wording of the signs and the guidance to the claimants and other parking companies is that the signs should be unambiguous. Where it says two hours maximum stay, it does [inaudible] say, ‘Customer only parking, for use only whilst shopping in the store.’ It says, ‘No parking allowed outside these times,’which is Monday to Saturday 9:00 am to 8:00 pm, Sunday 10:00 am to 4:30 pm. It says, ‘Failure to comply with this will result in a parking charge of £100.’ I do not think that that is a clear sign. I know it says that parking is limited to two hours, but it does not say that there will be a fine of £100 if someone overstays their limit of two hours because it refers to no parking allowed outside these times and failure to comply with this will result in a parking charge of £100. That refers to the parking times Monday to Saturday 9:00 am to 8:00 pm and Sunday 10:00 am to 4:30 pm. Therefore, the sign is not clear and so the defendants succeed on that particular point. 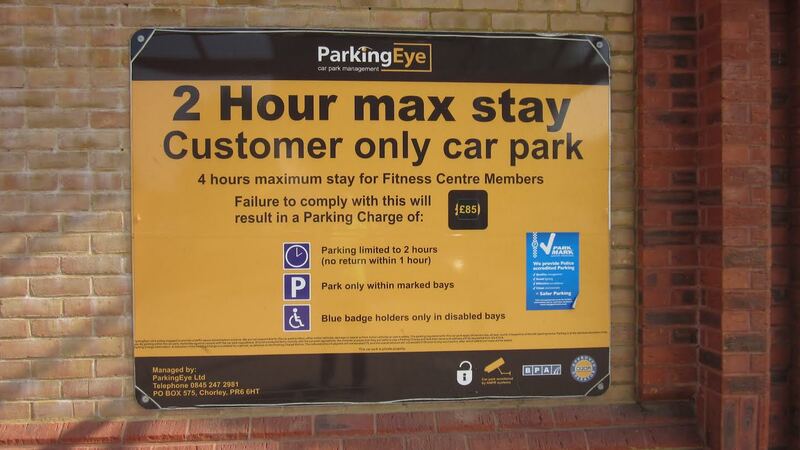 ParkingEye are well aware of this, and have been changing signage to remove this wording. What would the Supreme Court have made of this? The Prankster believes their underlying rationale may have remained the same. However, this particular case would have had to be found for the motorist, according to UTCCR 1999*. So the big question is, was this omission from the evidence accidental or deliberate? If you think the Supreme Court have reached the wrong decision because of incomplete evidence, consider signing Barry Beavis's petition to ask the Government to take a look at the level of private parking charges. *This has now been replaced by the Consumer Rights Act 2015, but the principle remains the same in the new act. This is a guest post from The Penrith Phantom. Morrisons in Penrith is required to make its car park available for at least 2 hours free parking for everyone in accordance with the planning consent conditions for its supermarket. 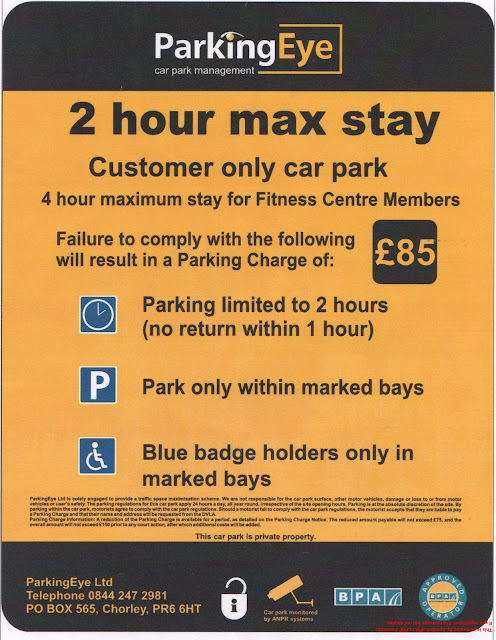 The parking regime has to be one approved by the local Planning Authority, Eden Council, which has approved a Car Park Management Plan which provides for 2 hours free parking between the hours of 8am and 5pm with no return within two hours. That Car Park Management Plan then indicates that unlimited free parking is available between the hours of 5pm and 8am the following day. The plan even provides that if you park at 3pm for two hours, you can actually stay for as long as like after 5pm even if that takes you over your two hours parking limit. The restriction on the two hours ends at 5pm. ParkingEye is managing the car park and, as you can imagine, it operates contrary to the Car Park Management Plan, and thus is in breach of planning control. One of its signs here indicates that if you enter before 5pm you can only park for up to two hours. 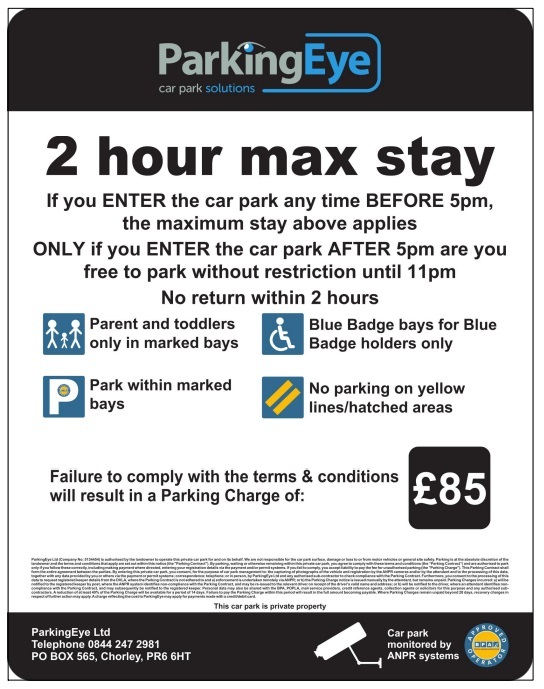 Thus if you enter at 4.30 you must leave before 6.30 – yet there is unlimited parking after 5pm according to the car park management plan. 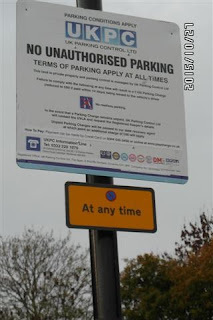 This sign also indicates that parking ceases at 11pm which is in contravention of the Car Park Management Plan. 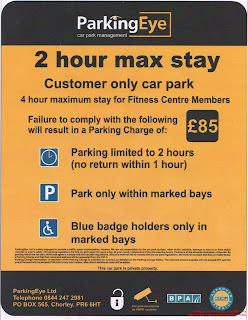 When the Car Park Management Plan was being considered by the Eden Council’s Planning Committee, Morrisons agent, Mr Goddard of Bryan G Hall, Engineers of Leeds, confirmed that Morrisons allowed motorists a 30 minute grace period before there would be any requirement to pay a parking charge. ParkingEye does not adhere to that requirement. So, what the Landowner wants to see from its parking enforcement is not being implemented by its agent ParkingEye. What the Planning Authority has approved as the required parking operation is not being properly implemented by Morrisons agent. Is Morrisons going to do anything about the conduct of their agent? Morrisons has said that if any genuine customers of Morrisons receive a parking charge then they would be willing to waive the charge. That does not assist non-customers caught out by ParkingEye’s impropriety. Further when asked if they would put a sign up in the store to let people know of this arrangement it would not confirm that it would do so. Let us hope that motorists in Penrith are clairvoyant. It does seem ironic that ParkingEye do not believe the laws of the land apply to them while charging motorists huge amounts for minor overstays. This pepipoo thread records the result of Gladstones' latest venture at court. As usual, the motorist won, the parking company lost, and Gladstones Solicitors pocketed their fee. As no-one from The Parking Ticketing Company Ltd showed up the claim was dismissed within 5 minutes. 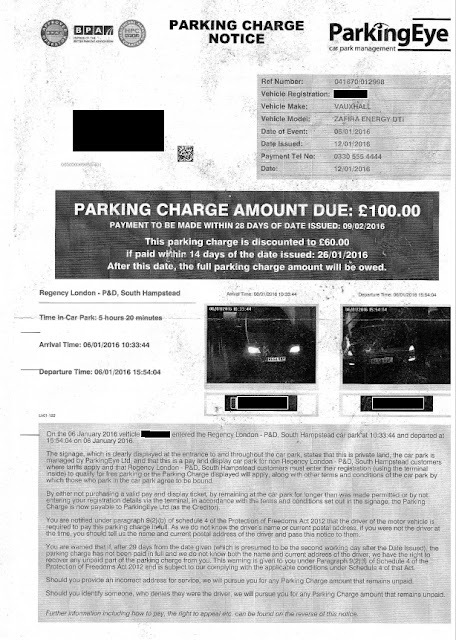 Costs of £79 were awarded against The Parking Ticketing Company Ltd.
Gladstones asked for a paper based hearing several months ago, but this was denied by the court and both parties were ordered to attend. The day before the hearing Gladstones emailed the motorist saying they were not going to attend, and neither was the parking company. This is against civil procedures which clearly state 7 days notice needs to be given, otherwise the court can strike out the claim. We will not know the exact dialogue between Gladstones and their client, but failure to give the proper 7 day notice meant that the parking company did not even have the chance to have their arguments decided on the paperwork. It was therefore more than likely that the case would be struck out. The parking company could still have dropped the claim, which may have had a chance of saving them £79 costs. The parking companies must be wondering what the point of Gladstones is, apart from to charge them money and help them lose court cases. Gladstones typical trick is to file particulars of claim so brief that the defendant has nothing substantial they can defend against. The particulars give the date, registration, and reference, but do not state why the claim arises, what the contract was, how the contract was concluded or what the original parking charge was. They then write to the court or defendant saying the case is straightforward and it should therefore be considered on the paperwork. This is an attempt to outmaneuver the motorist and should be avoided at all costs. Agreeing to this means that Gladstones will pull their next typical trick and file their legal points disguised as a witness statement at the last minute, too late for any response by the defendant. As previously blogged, the witness statement may contain inaccuracies, but if you are not in court, you cannot bring these to the attention of the judge. The Prankster therefore suggests that your best chance of success is to attend court and robustly challenge their attempt to have the case heard on the papers. The defendant objects to the the request for a paper hearing. Both Link Parking and Gladstones solicitors have a record of filing incorrect documents in court. In Link Parking v Cowles B5GF95H3, Chippenham Court, 24/11/2015 in front of DJ Asplin, it was found that a witness statement prepared by Gladstones solicitors and signed by Martin Gardner of Link Parking, contained false information. Martin Gardner admitted signing the witness statement before it was fully prepared. As the facts of the case are in dispute, I believe it important to be able to orally challenge the claimant, and any witness statement they may file later. It is also noted that Gladstones regular behaviour is to ambush defendants in court by failing to provide any information until the last minute. I therefore wish to be able to challenge whatever information is filed should I disagree. It is noted that the correct procedure is to file any challenges to my defence as a reply to defence. Gladstones solicitors regularly ignore the court process by attempting to file new legal arguments in their witness statement at the last minute. As they are regularly assist in parking cases they are well aware this is not correct procedure. Should they do this, I would need to orally dispute this. For all these reasons I request that an oral hearing is held. Copies showing the claim struck out can be obtained from this blog entry. Do you think companies like Gladstones should behave like this? If not, sign Barry Beavis's petition and share it via social media. The Government today announced they are to bring in new regulations to curb the rogue elements of private parking. The regulations will come into force on 6th April 2016. Currently there are no details on what these regulations will be, apart from the following. 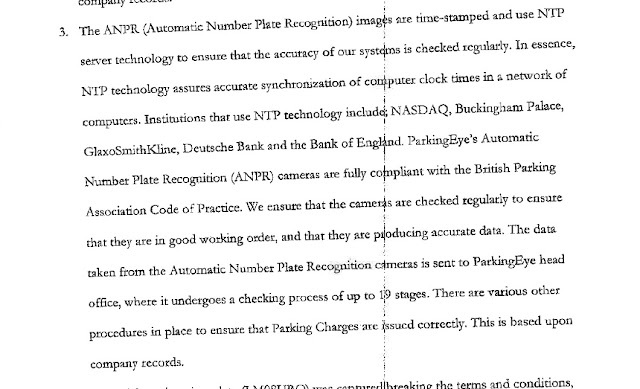 ParkingEye continue to issue fraudulent charges from their flawed ANPR systems. This newpaper report details the story of a 78 year old pensioner who visited Morrisons in Chorlton twice in two days. He picked up some groceries in the afternoon of 4th November and returned next morning to do some more shopping. ParkingEye's blundering ANPR system sent him a bill for staying overnight. Mr Bloohn appealed to ParkingEye who refused to accept his story. They only relented when CCTV pictures of his car parked overnight became available. However, many people will have fallen victim to this scam by ParkingEye, who continue to use ANPR when they are fully aware of its failings. Not everyone will have the luxury of CCTV images which can back up their story, and ParkingEye have hounded several people to court despite no contraventions actually occurring. Here is the typical text ParkingEye use in such cases. 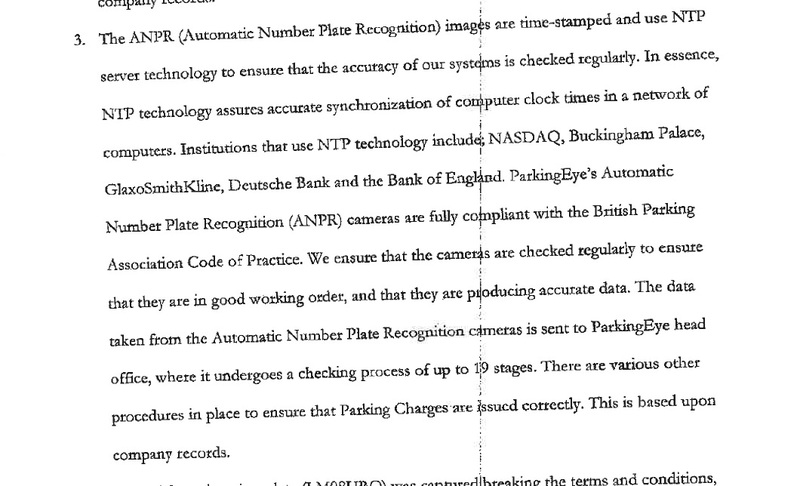 As you can see, ParkingEye are masters of trying to deceive the court, wittering on about NTP and the mythical 19 stage checking process (which has never been detailed, despite multiple requests), when the nub of the matter, which they hope the court does not realise, is that ANPR does not have X-Ray vision so a failure will occur whenever two cars drive too close. The Prankster has many times shown proof that ParkingEye's ANPR is not accurate and issues tickets when no contraventions occur. A while back, ParkingEye tried to shut the Prankster up, threatening him with legal action for defamation for suggesting their ANPR is not fit for purpose. The Prankster replied that truth is an absolute defence against defamation and ParkingEye shut up. Eventually. The NoToMob have been collecting evidence about faulty ANPR on this thread. The Prankster suggests that anyone facing a court case where they visited twice but ParkingEye claim they visited once prints out the entire thread and files it as evidence. Meanwhile, Barry Beavis's petition regarding the level of parking charges has hit 8,000 votes and needs another 2,000 to get a parliamentary response. Click on the link to read the petition and add your vote. Last week the case against Civil Enforcement Limited was heard over two days in Aberdeen. In a clever move by the defence, most of the evidence was ruled as inadmissable meaning the meat of the case could not be heard, and inevitably therefore none of the charges were proved. ‘We are very disappointed with the outcome of the case. The Civil Enforcement Limited bosses blamed everything on their incompetent employees not following the right procedures and sending out the wrong letters. The Prankster can reveal that the evidence filed by ParkingEye in the Beavis case was incorrect and may have had an effect on the final judgment. 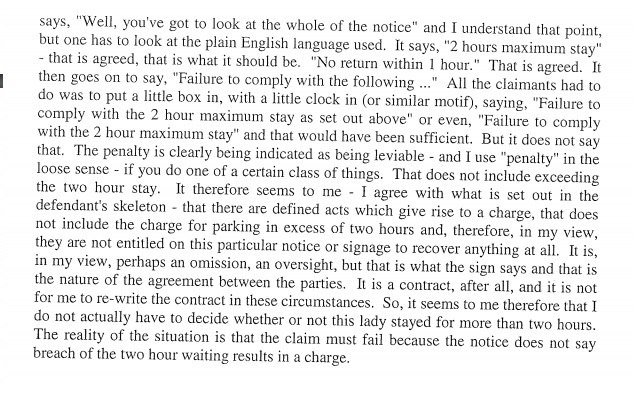 It is clear that signage plays a big part in the judgment and that the basis the contract is not unfair is due to the 'clear and plentiful' signage. 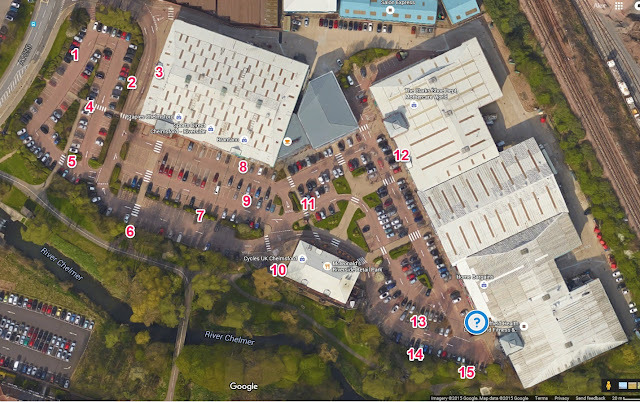 Here is a copy of the signage map filed by ParkingEye as evidence. From this map it is clear that you can hardly move around the car park without bumping into one of the 20 huge blue or yellow signs. Here is the judges finding of fact based on that information. Para 90. At all material times since then, ParkingEye has displayed about 20 signs at the entrance to the car park and at frequent intervals throughout it. The signs are large, prominent and legible, so that any reasonable user of the car park would be aware of their existence and nature, and would have a fair opportunity to read them if he or she wished to do so. But what if there were fewer signs? The judges may well have come to a different decision. One possible judgment would be that they still ruled a charge of £85 may be valid, just not in this car park. Another possibility might be that the case would have been thrown out due to false evidence. At what level might the judges have changed their mind? If there was only one sign in the car park, then this would almost certainly result in the appeal being won. If there was one fewer sign than the evidence claimed, perhaps the judgment would have stayed the same. Somewhere in between will be the tipping point. The Prankster can now reveal the actual signage in the car park. For clarity, signs are shown at twice actual size. What? You can't see them? Ah, perhaps twice actual size isn't big enough. Here they are again. Yes, that's correct - only 15 of the 20 signs ParkingEye claim are present in the evidence are actually there. Five of the twenty signs ParkingEye claim were present are not. Fully 25% of the signs claimed were missing. In addition one sign (number 5) was in the wrong place and there was one extra sign not mentioned, which means that around 1/3 of the signage evidence submitted to the Supreme Court was either plain wrong or misleading. But would this have made a difference? Here is the map again, together with the area of influence of each sign. Parking spaces within 5 bays of a sign on the same row are shown in green. These are all close enough that the driver would almost certainly spot the sign. Parking spaces withing 10 bays are shown in orange. These are warning bays. A driver might well be likely to miss a sign. Parking spaces in red are danger areas. They are so far away from a sign that a driver would be very likely not to realise restrictions exist. Although the Prankster has not done this, there is also a case for disabled bays to be given special treatment. A disabled driver isn't going to go mooching around the car park looking for signs; the driver is also likely to be in a wheelchair. Disabled bays could therefore be marked in red if there are no nearby signs low enough to read - disabled drivers are after all likely to need longer to shop than able bodied drivers. In actual fact for this car park, most of the disabled bays are classified as 'red' anyway, meaning there are no nearby signs. So there you have it. 172 well signed spaces, 233 badly signed spaces, and 67 spaces which can only be classed as entrapment zones, including most of the disabled bays. Of the 472 spaces, 63% are badly signed and of those 14% are ParkingEye's cash cows. The Supreme Court verdict is water under the bridge and Mr Beavis will not be getting his £85 back. However, there is real doubt that the Supreme Court would have ruled the way they did had ParkingEye not provided incorrect information. The rationale may have remained the same, but the verdict may have gone the other way for this particular car park and this particular set of signage. This of course is not an isolated car park, and most other ParkingEye car parks have similar signage problems, with large areas of poor signage, together with distinctive entrapment zones. Worryingly, many of the entrapment zones are either in disabled bays, or are at the shopfront, where a motorist would just drive up, enter the store and so never see the signage far behind them. ANPR car parks are not like warden patrolled car parks - there is no reason of risking parking a few minutes extra on the chance the warden will not visit. Every single overstay will result in a charge being issued. Therefore as no rational person would overstay, the only reasons this would happen is in the case of an accident, or if the motorist missed the signs and did not realise the time limit. Signage therefore plays a huge part. Unscrupulous operators have a huge incentive to provide poor signage, and the more canny of these will cleverly have good signage in some areas of the car park, while creating entrapment zones elsewhere. 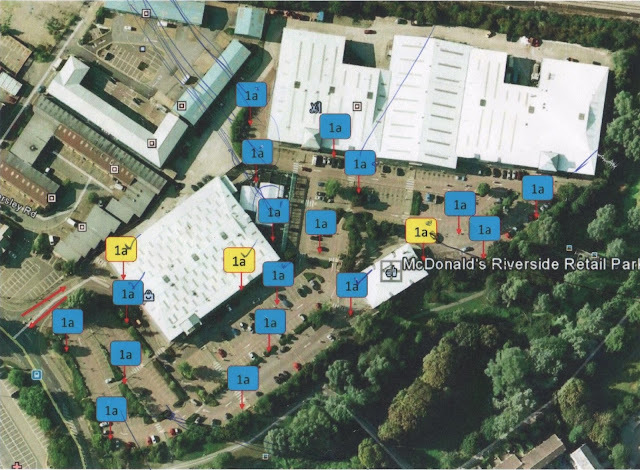 The Government are currently consulting on the bad practices in the parking industry and so there are several ways this problem could be quickly and easily fixed - for instance by defining what the minimum acceptable standard of signage coverage is. Currently the codes of practice of the parking industry fall conveniently silent on any quantifiable standards, preferring instead to define the minimum size a sign must be. Imagine the situation. You get back to the car park, go to the machine, enter your registration and it tells you how much you owe for parking. This is because the ANPR knows what time you arrived in the car park. So far so good, and The Prankster has previously recommended such systems. However ParkWithEase has found a way to exploit motorists which has been upheld by the IAS. The way they do it is this. Suppose at time x the motorist owes one amount, but this is the end of one charging period. One second later the motorist owes another amount. ParkWithEase are penalising motorists, even if they leave the car park straight away, saying they did not pay the correct amount. The Prankster has heard from one motorist who checked the machine and fulfilled the terms and conditions in force at the time. They then left. 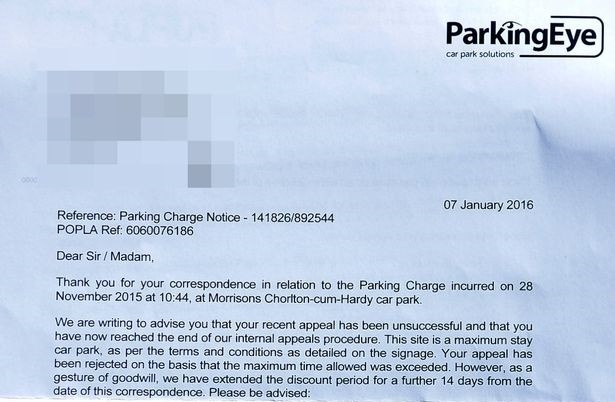 ParkWithEase charged them £50 for straying 4 minutes into the next charging period, and this was upheld on appeal by the IAS. Drivers should be allowed a sufficient amount of time to leave a site after a pre-paid or permitted period of parking has expired. Four minutes would seem to be a reasonable period from the point of paying to get back to the car, strap the children in, and leave. (In fact, the British Parking Association mandates a 10 minute grace period) The IAS barista did not agree, and stated that as the driver had contractually agreed to the conditions they were liable to pay the £50. The Prankster recommends that motorists avoid visiting the site, which is White Moss (near Rydal) in the Lake District, unless they are happy to risk paying £50 for parking even if the motorist fulfills the conditions at the time they attempt to pay for parking. There are a large number of online complaints about this car park. The Prankster is not surprised. As well as the approximately 3,800 cases stayed from the old POPLA run by London Councils, the new POPLA is also staying cases. No mention of how long the POPLA review will take has been made. The Prankster considers this a sensible move. The Beavis case was won by the parking operator and parking companies have been calling this a landmark case which justifies all parking charges. Of course it does not and the Supreme Court were careful to point this out. The Supreme Court judgment is binding case law, but that law may be beneficial to operators in some cases, and to motorists in others. For instance, Parking companies often quote the case of Vine v Waltham Forest to assert that a contract can be made by performance. However, that case was won by the motorist. It is clear from the tweet that the 'clear wording of the notices' was important, but as a tweet is not binding case law it is also useful to clarify this by looking at the actual judgment. Case law from Beavis would therefore lead to the conclusion that a vital ingredient is that the signage be ample, the charge clear. Take for example this sign from Excel Parking from the Peel Centre, one of the most complained about car parks in the country. The sign is a mass of confusing and contradictory words. The charge, in case you did not spot it, is £100 hidden in the small print at the bottom of the sign. 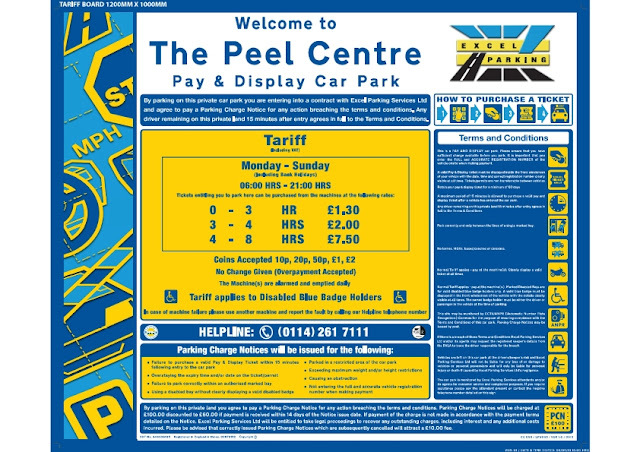 Additionally, large parts of the sign are in blue on yellow, a combination warned against by the British Parking Association code of practice as hard to read. Binding case law from the Beavis case would therefore appear to support the assertion that the charge of £100 in the Peel Centre would be a penalty and therefore not enforceable. 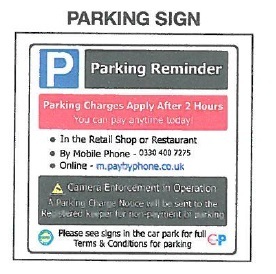 Similarly, in the ParkingEye case it can be seen that the car park was a customer only car park from which you may initially conclude that if you park there, but are not a customer, then you need to pay the charge of £85. However, look a little closer at the wording of the sign. A Judge in the Beavis judgment, at para 193, observed that - “The only comment that one might make, is that, although the signs made clear that it was a “Customer only car park”, the Parking Charge of £85 did not apply to this limitation”. So, even in the Beavis car park if they sue anyone for £85 for parking whilst not being a customer ParkingEye is on a loser. It appears that far from being a deterrent to commuters staying all day, what ParkingEye have created is a car park where they can only gouge genuine customers. POPLA will therefore need time to consider this and other issues and The Prankster will keep an eye on developments. Civil Enforcement Limited were in court today in Aberdeen on fraud charges. The case is expected to conclude tomorrow. Meanwhile, a number of forum reports and request to The Prankster have noted that recent court filings from CEL have concerned cases where the motorists claim no notice to driver or notice to keeper were ever served. If this is correct then this would seem to be a far cheaper way of running a parking company. Why bother with actually doing all that tiresome car park management when you can just serve court claims on random members of the public.Enough will pay up to make your business extremely profitable. As for motorists hit with these outrageous claims, all they need is a watch...oh, wait! Have you had a fake Notice of Enforcement from DCBL? DCBL have issued a number of letters titled 'Notice of Enforcement' which appear to resemble statutory 'Notice of Enforcement' but in fact are just debt collector letters. The letters also appear to artificially inflate the alleged amount owed so that the amount goes over £605 in two stages. This is the amount at which a high court writ can be issued if the claim is upheld at court. No doubt all the other debt collection companies are keeping an eye on proceedings and will shortly be following suit if the tactic works. A sample letter follows, but it is always best to use your own words. I understand Direct Collection Bailiffs Ltd, http://www.dcbltd.com/ have been granted permission to conduct credit activities following the changeover from the OFT. In light of that, I thought it pertinent to bring to your attention their debt collection activities. I attach a copy of the letter they sent to me. As you will see from the attached, DCBL have provided a document entitled Notice of Enforcement. The notice displayed bears an uncanny and remarkable resemblance to the statutory Notice of Enforcement issued in April 2014 under the Taking Control of Goods Regulations 2013. The truth of the matter is that the notice is not a statutory notice. Instead, it is a notice that (for want of a better word) has been cleverly doctored to resemble a Notice of Enforcement. You can no doubt compare the two. 7.3.14 (1) A firm must not take disproportionate action against a customer in arrears or default. 7.7.4 Where a firm has a contractual right to levy default charges, a regulated credit agreement must state the charges and the conditions for making the charge under, as the case may be, the Consumer Credit (Agreements) Regulations 2010 (SI 2010/1014) or the Consumer Credit (Agreements) Regulations 1983 (SI 1983/1553). 7.7.5 A firm must not impose charges on customers in default or arrears difficulties unless the charges are no higher than necessary to cover the reasonable costs of the firm. 7.11.1 When contacting customers, a firm must not misrepresent its authority or its legal position with regards to the debt or debt recovery process. I hope therefore that you can investigate this matter, and take due note of your findings when the time comes to finally decide whether to grant DCBL a credit licence or not. The Prankster has been informed of more scams by UKPC. 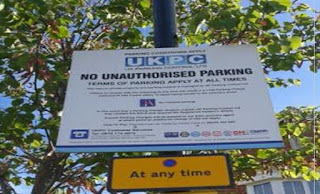 Apparently UKPC have been copying statutory council no waiting 'At any time' road signs and placing them underneath their own signs. Of course, it is also possible a random passer by placed the no waiting signs there and UKPC then just happened to place their signs above them. These signs were present at St Mary's Park, Hook, RG27 8EQ in October 2015 when the photographs were taken. This appears to be a case of misrepresentation of authority. Parking companies have been found in the past to be guilty of making their tickets look like council tickets so that motorists believed there was statutory force behind them. This is exactly the same thing. 14.1 You must give clear information to the public about what parking activities are allowed and what is unauthorised. You must not misrepresent to the public that your parking control and enforcement work is carried out under the statutory powers of the police or any other public authority. You will be breaching the Code if you suggest to the public that you are providing parking enforcement under statutory authority. "If there's a repeat of any kind of misbehaviour, that will almost certainly result in expulsion or further suspension." It appears that Mr Troy may have had a change of heart. exclusively for placements on the public highway. markings at St Mary’s Park. private land adjacent to public highways. taken to secure their removal.